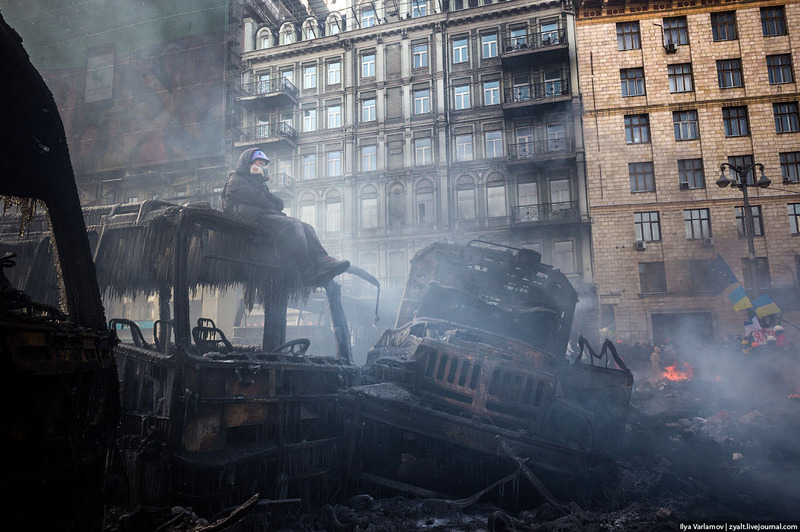 Posted on 26/01/2014 by Ed Sutton	in Photography, Streets & Squares, War & Violence and tagged Ilya Varlamov, Ukraine. 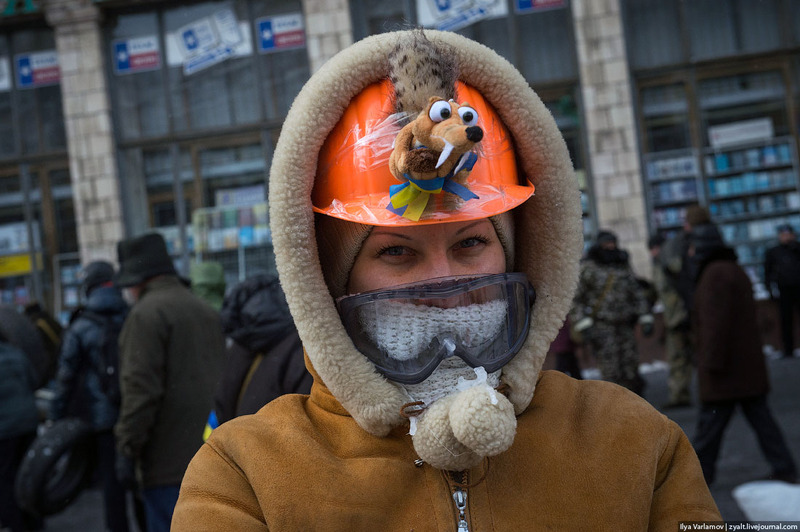 AntiNote: These photographs were taken over two days in Kiev last week, 22 and 23 January 2014, by citizen photographer Ilya Varlamov. He posted them today on livejournal, with his own commentary. We have selected a few of the more impressive images, and have included Varlamov’s captions where appropriate. 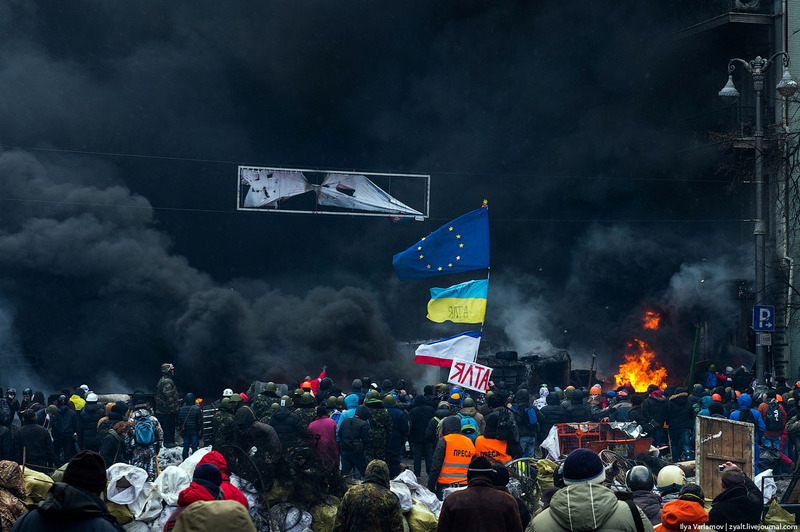 He warns that Western media’s impressions of last week’s reactionary escalations in Kiev are largely mythological and exaggerated. 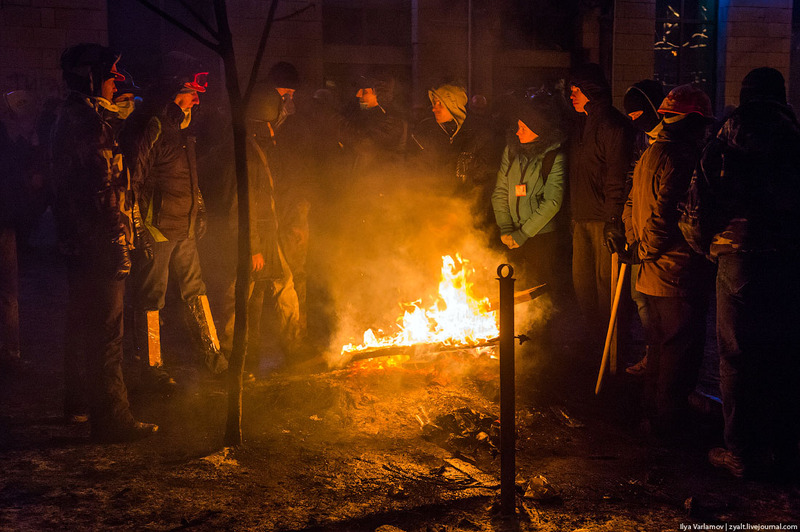 Nonetheless, AntiDote takes seriously the analyses of our comrades working with New Left groupings in Eastern Europe, which argue that the Euromaidan movement and opposition to Viktor Yanukovych’s corrupt government have been increasingly instrumentalized by radical rightwing and nationalist groups. We caution our readers to maintain a healthy skepticism, and we by no means intend to offer support or encouragement to forces with racist, chauvinist, militaristic, or totalitarian designs. I came to Kiev to see for myself what is happening here. Of course, an hour after arriving at Maidan, you begin to understand that everything you’ve read in dozens of articles and seen in TV news reports is total crap. 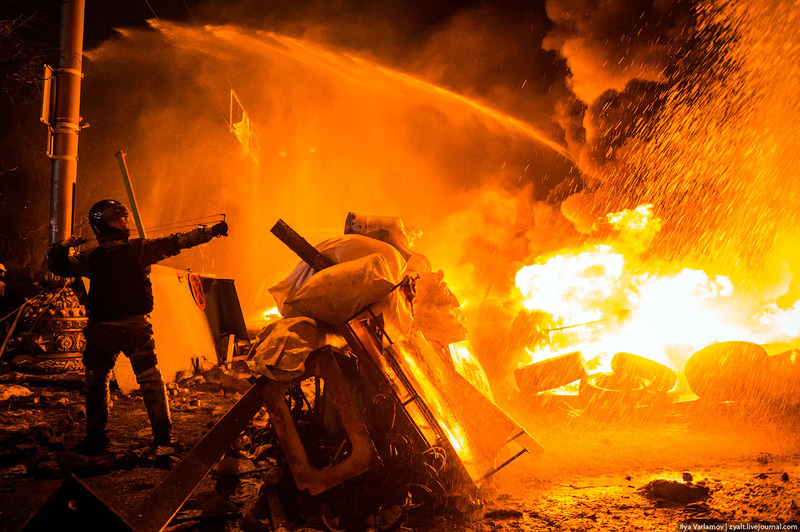 With these photographs I will try, as objectively as possible, to sort out this new wave of the Kiev revolution. Mihaila Grushevskogo street. The first barricade has been erected here. The guards do not allow in outsiders. 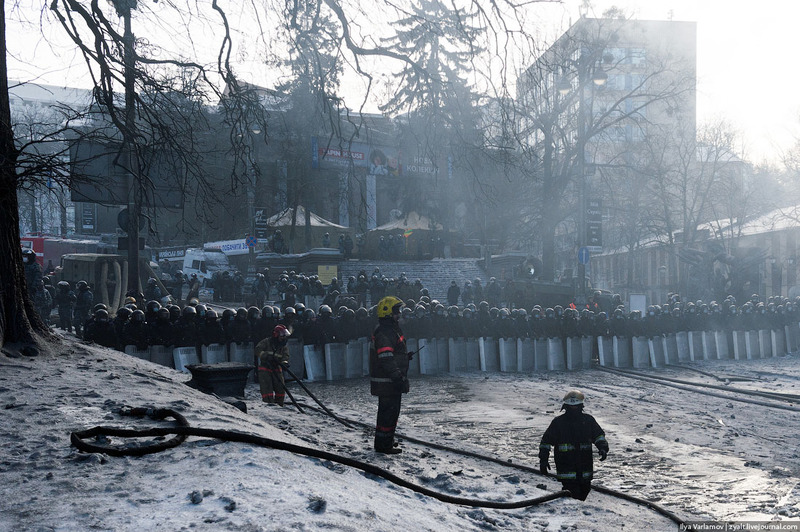 Only the press, the volunteers, and the activists, ready to fight Berkut (Ukranian SWAT), are allowed to pass. All onlookers are stopped at the approach, to prevent them from interfering with work. 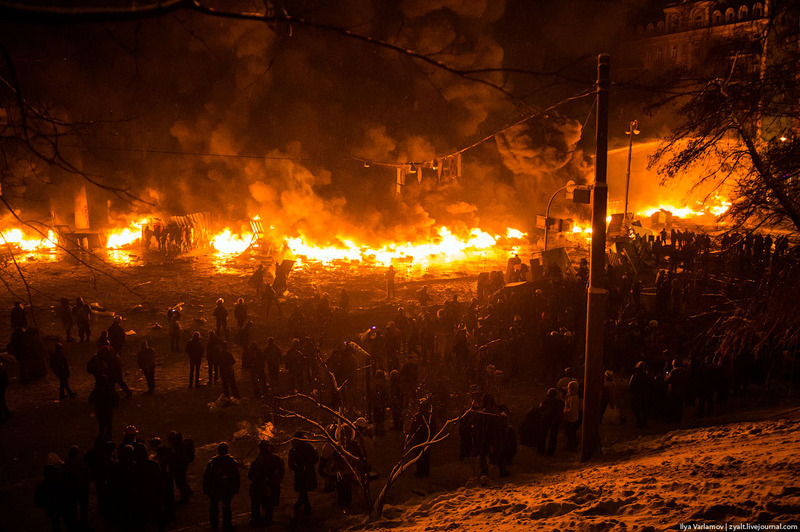 This is the main burning barricade near the Dinamo stadium, about 100 meters away from the first. 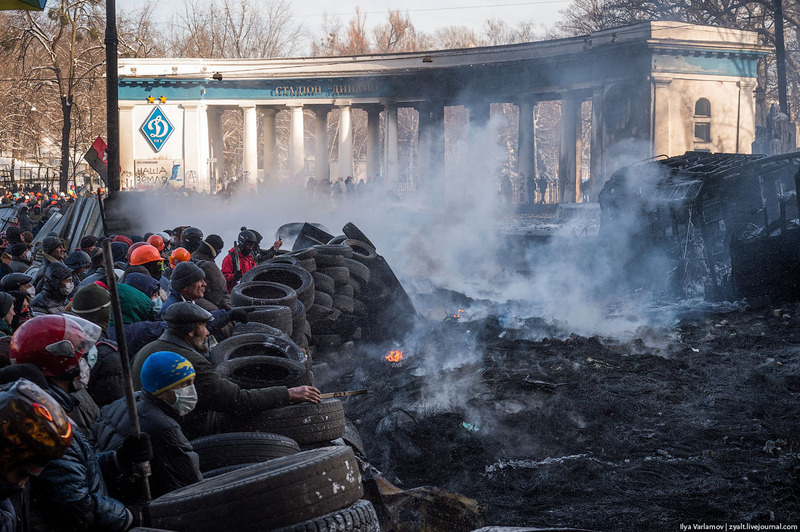 It consists of hundreds of burning tires, which are brought here from all parts of the city. 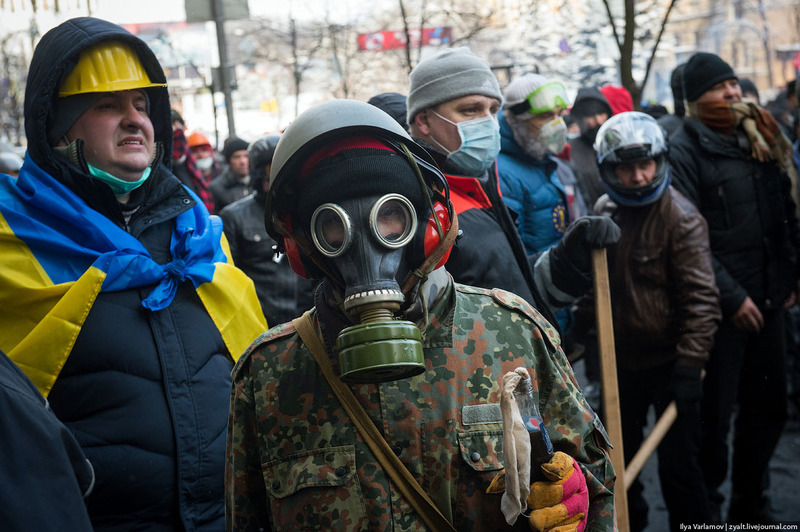 The demonstrators got lucky with the wind – it carries the black smoke directly at the squads of Berkut and national guard standing behind the fires. The smoke completely obscures the view and both sides are currently working blind. Onlookers watch the fight from a hill nearby. The battle has continued for 4 days. 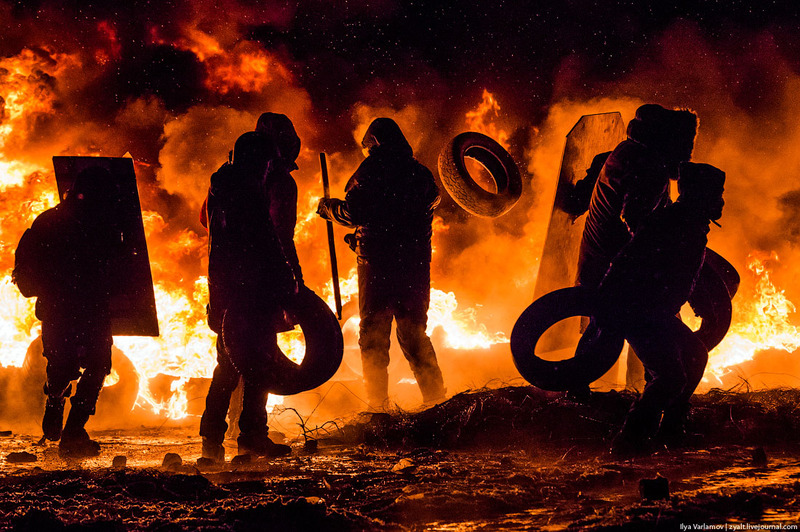 The fire is constantly fed by more tires. The smoke screen must be dense! 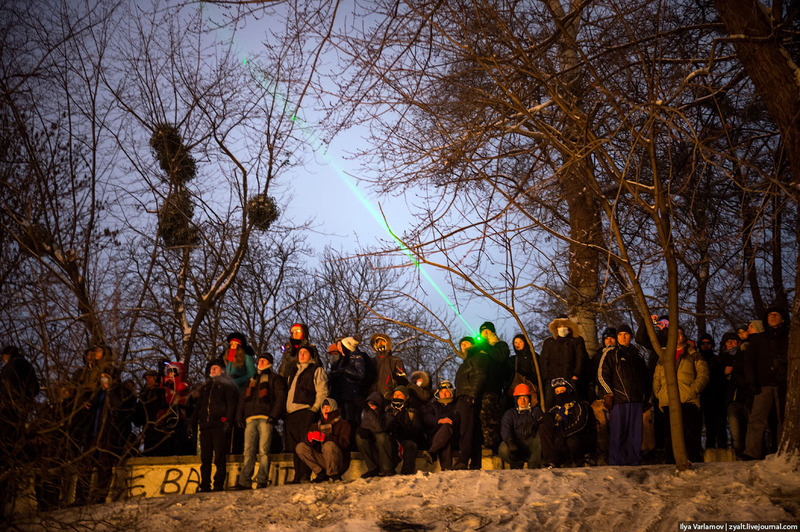 At one point Berkut attempted to feel out the protestors from a hill using a powerful projector. Actually the center of Kiev is very pretty right now. 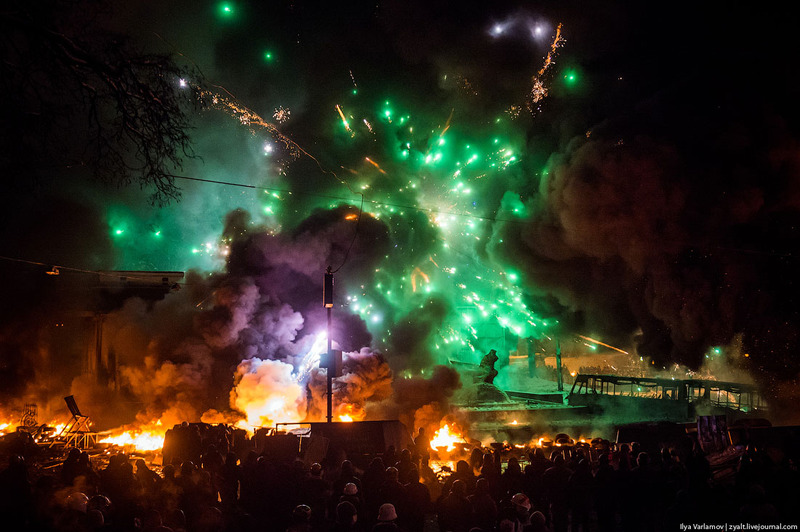 Protestors periodically shoot fireworks at Berkut. The entire square lights up and people cheer. 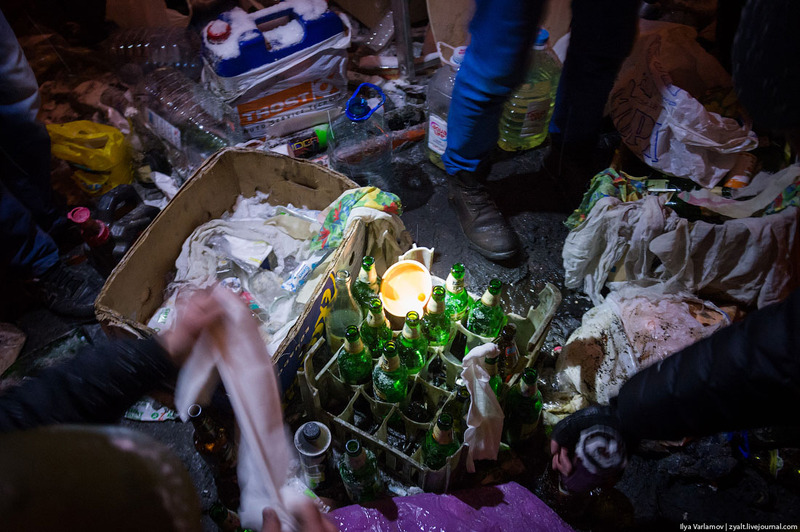 In a nearby alley people prepare Molotov cocktails. Most of the bottles contain either pure kerosine or gasoline, the recipe is no longer followed. Empty glass bottles are in a big deficit. There are problems with bottles here. The mixture inside is liquid, not thick like in the original Molotov recipe, and the fuse is a simple rag. During the throw, part of the gasoline can spill out and light up the thrower. Of course the fire is quickly put out, but effectiveness is low. Almost 50% of all cocktails spill out before hitting their target. The onlookers on the hill help out in any way they can. Sometimes they use lasers to blind the Berkut fighters. At one point the police wer able to climb the colonnade entrance of the stadium and began to rain Molotovs and teargas grenades down on the protestors. 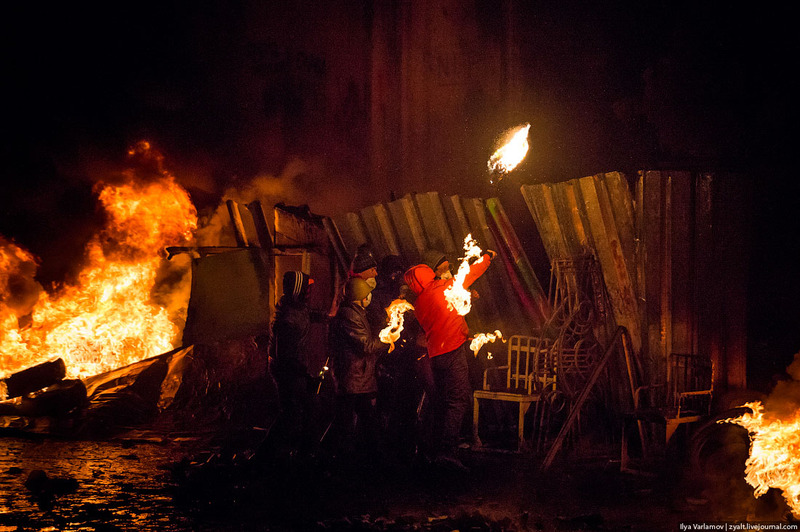 The onlookers used lasers to hit the Berkut in the eye. Campfire behind the barricades, where the wet and the frozen dry and warm up. 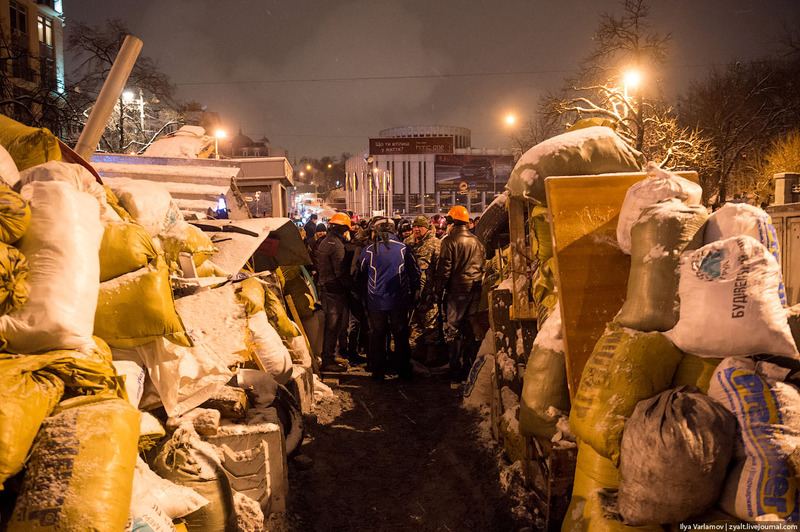 Morning arrives, 23 January 2014, and with it a temporary ceasefire at Maidan. Everything is still on fire, though, and tightened with a smokescreen. Burning tires turned out to be a very efficient tactic. Police troops can’t see what is happening and are unable to attack, though there are disadvantages as the protesters can’t see the police’s positions either. At midday Klichko came to the barricades and announced a temporary truce. 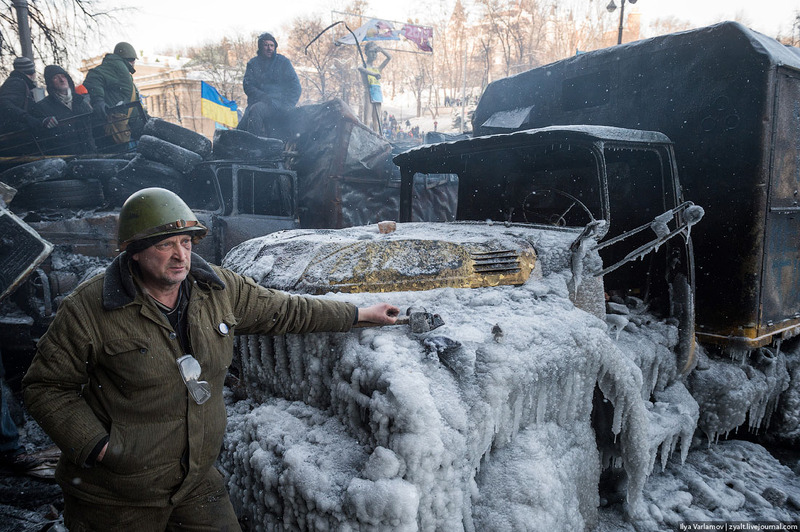 The second round of negotiations with Yanukovich was due to take place today, and Klichko asked protesters to cease fire and extinguish tire blazes until 8 PM. The police promised not to open fire on protesters, and to stop throwing grenades and pouring water. Everyone agreed – Klichko happened to be the only opposition leader whom the crowd listened to. Just yesterday nobody was listening to him. 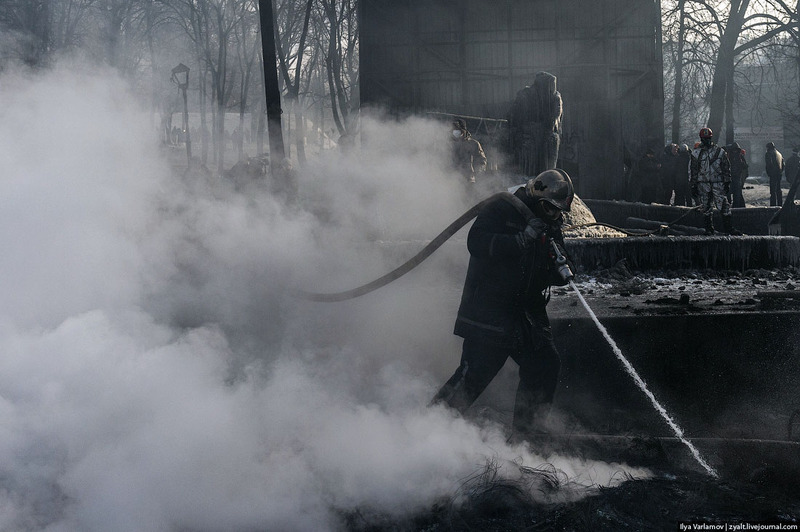 After the truce came into effect, firemen started extinguishing the burning barricade. A wonderful view opened once the fire went out. 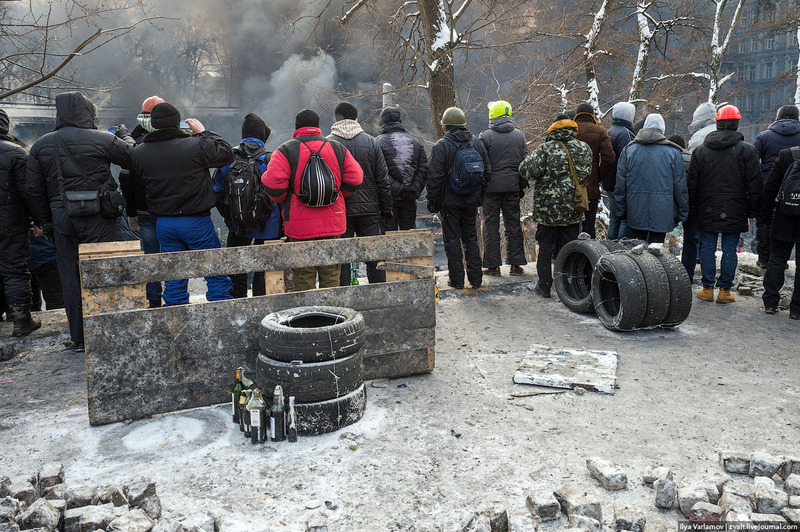 Though Berkut troops could now be seen standing angry and soaked in smoke. Throughout the truce I spotted no provocations from either side. Monument to Lobanovsky next to the stadium is neatly covered with cloth. People get warm next to a campfire. 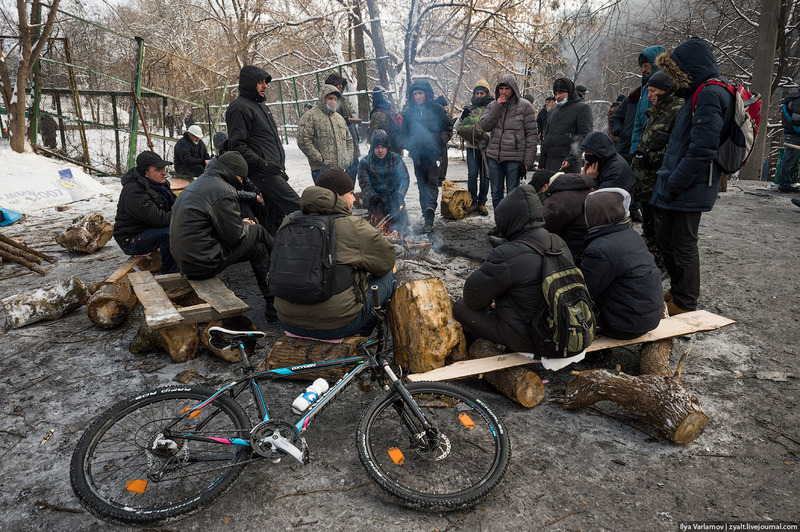 Is revolution possible without a bicycle? I say no! People on the hill stay prepared for an assault. Stones, incendiary bottles and tires tightened with barbed wire will be thrown at the attackers should it become necessary. 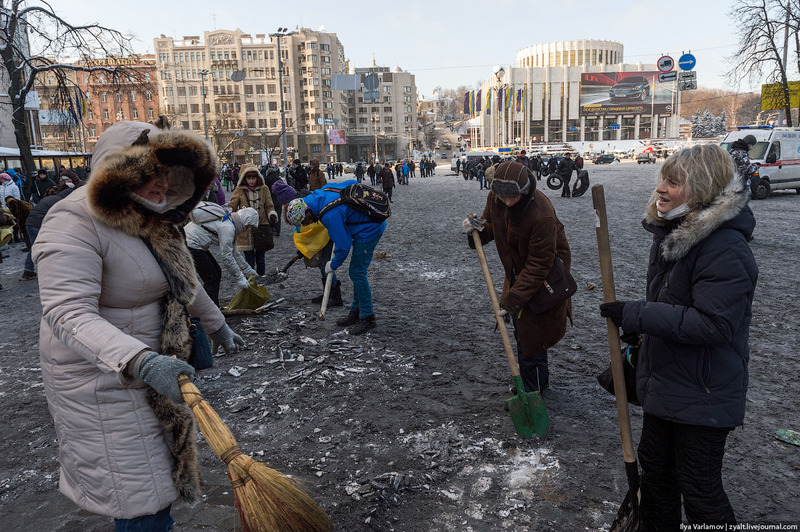 People hammer the packed, ashy snow, then load it to sacks and bring to the barricades. Snow serves as the main building material here. 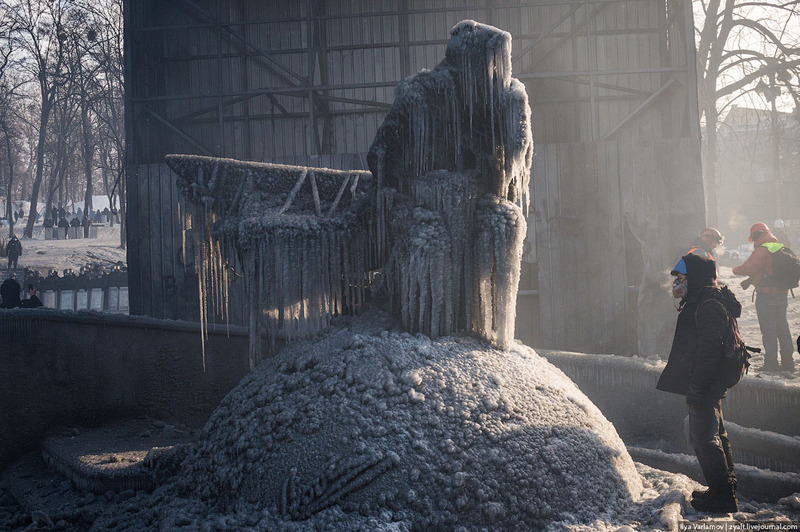 Sacks are poured over with water – the monolithic icy barricades which result are very difficult to destroy. 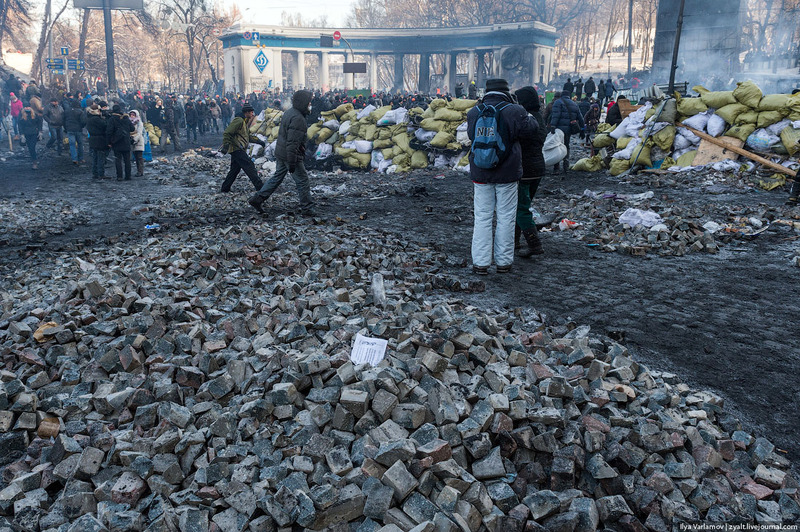 The Maidan’s quarries. 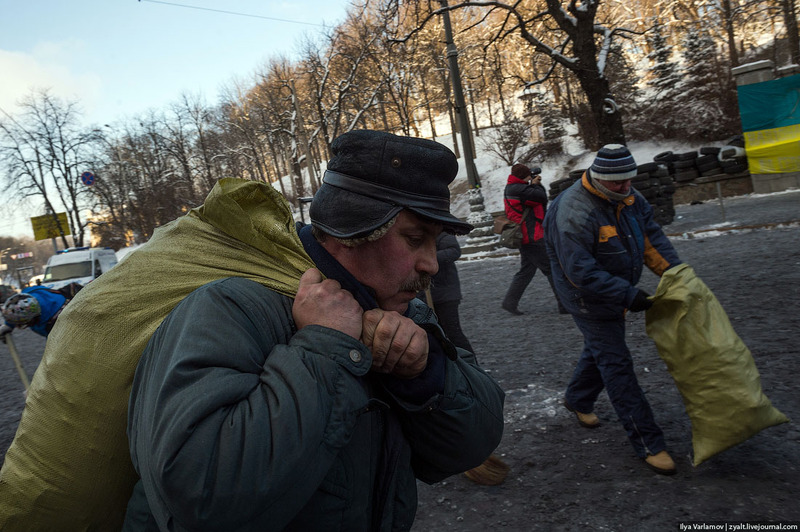 People break the street into easy-to-throw stones, load them into sacks and bring them to the frontline. Look at the people. I said it already, but will repeat: all social classes are present on the squares – from students to pensioners.